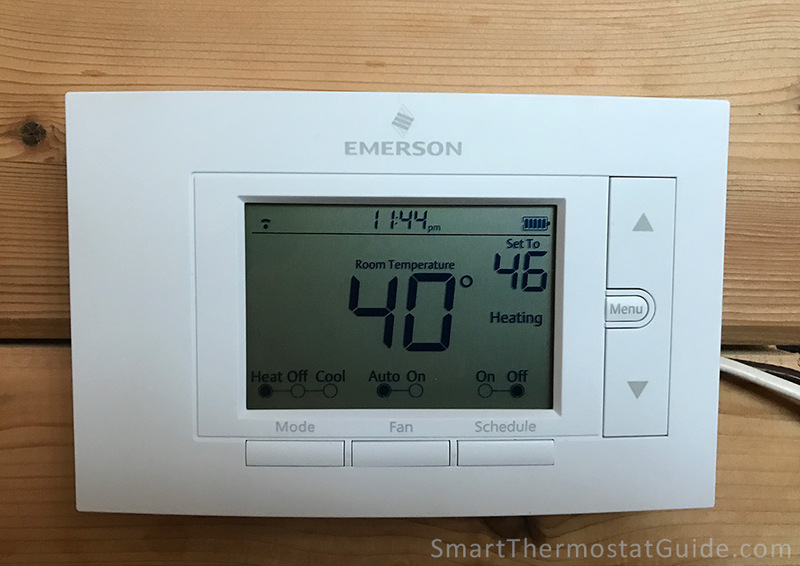 Say hello to Emerson Sensi, a WiFi thermostat with all the features you want and a price point that will leave enough cash left over for dinner at the fanciest place in town. What if I told you that you could get all the power of a WiFi enabled thermostat (remote control, ease of scheduling) at half the price of the flashier thermostats? Technically, its full name is the White-Rodgers Emerson Sensi Wi-Fi Thermostat, but we’re gonna just go with Sensi for short. And it is a great thermostat, especially if all you care about is accessing your thermostat remotely and setting schedules with ease. March 2016 update: Amazon Echo now supports Sensi! Give a command in the form of, “Alexa, set my bedroom temperature to 64” or “Alexa, increase the temperature in my home” to try it out. Note: Our installation site did not allow for hiding the wires in the wall, but most homes allow for hiding wires in the wall behind the unit. We think the Emerson Sensi is fantastic and award it 4.5 stars out of 5. If you’re on a budget (or just don’t want to pay $250 for a thermostat), look no further than the Sensi. Yes, it’s not as full-featured as many smart thermostats (you won’t get fancy-pants stuff like motion sensors or geofencing), but to many homeowners that’s just fluff anyway. With an average rating of 4.5 out of 5 stars on Amazon.com, the Sensi is a well-liked alternative to flashier smart thermostats. 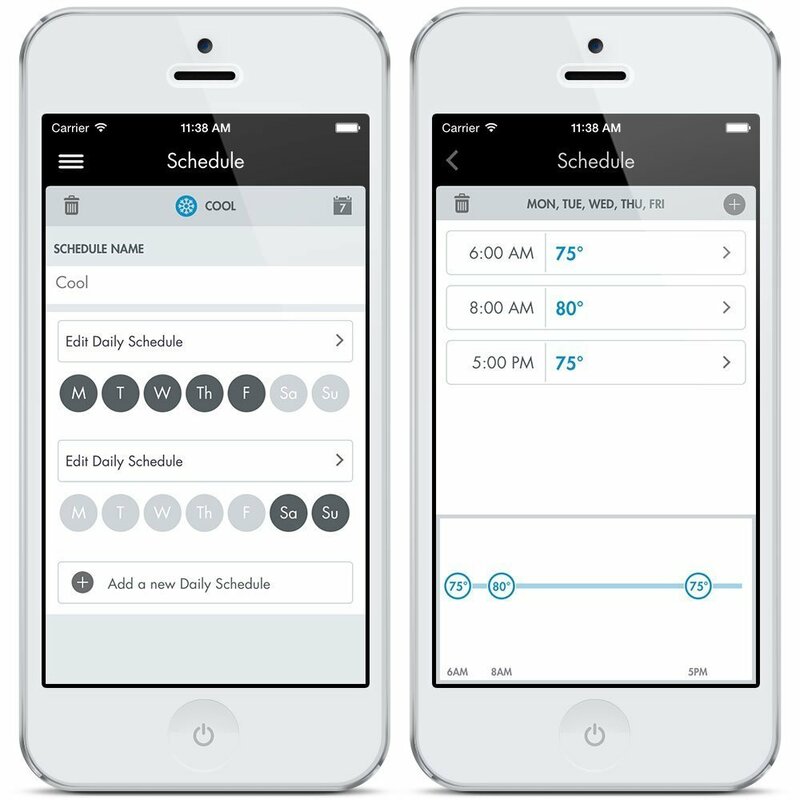 It’s like a programmable thermostat that you can schedule yourself and control through your phone. To get a full 5 stars all we would want are some usage reports, but that’s being super picky, especially at this price point. The Ecobee Smart Si (our review) is similarly featured and priced, but we like the look of the Sensi more and we appreciate that it works in more HVAC systems without having to also set up a power extender kit (which isn’t even included with the Smart Si). 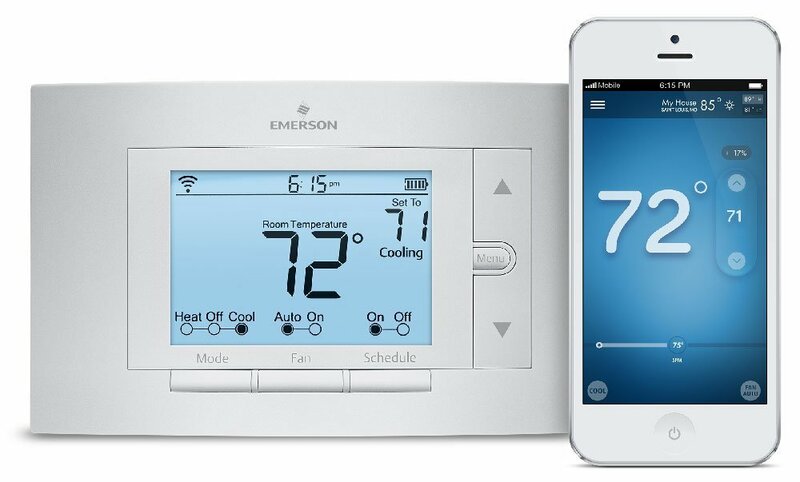 The Emerson Sensi thermostat lets you control your thermostat from your phone without any additional complexity. Emerson is an old name in thermostats (some 75+ years) and has decades of experience working with a huge variety of HVAC systems. Many reviewers who had problems installing or maintaining a stable connection with Nest found the Sensi to be much more reliable. Why run wires if you don’t have to? Sensi is designed with low power consumption in mind, and works in a majority of combined heating and cooling system homes without a c-wire. The two AA batteries provide backup power and are expected to last months before needing replacement. The exceptions, of course, are heat-only and cooling-only systems. It is not possible to run the WiFi features of the thermostat on AA batteries alone (unless you like changing batteries every couple hours). If this describes your home’s HVAC setup, you will actually need to run a c-wire or consider a solution like Venstar Add-a-Wire. If you have a predictable schedule, it’s easy to program it in. If your schedule varies wildly by day, it’s easy to override the programming. With the Sensi, you put your schedule in yourself. The Sensi doesn’t attempt to “learn” anything on its own. Scheduling, overrides, and settings are right there on the smartphone app, which is nice looking and easy to figure out. The app is available for iOS (reviews and screenshots) and Android (reviews and screenshots). The worst complaint about the app seems to be the occasional inability to connect. Set and edit schedules from your smartphone or tablet. In March 2016, Emerson and Amazon announced Amazon Echo integration for the Sensi! The smart thermostat can now be controlled by Amazon Echo and Alexa, Amazon’s cloud-based voice-controlled service. There are no additional fees or apps to use, just let Echo discover the Sensi and start issuing commands. For example, you can say, “Alexa, set the upstairs temperature to 72 degrees”. 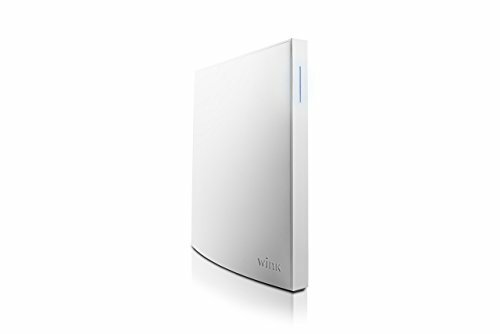 In July 2015, Sensi added integration with the Wink Home Hub, a centralized home automation system that lets you control all of your connected devices from one app. You can use the free Wink app instead of Sensi app, if you prefer (iOS | Android). It just looks normal, and for a lot of people that’s a good thing. It’s very slim against the wall (just a bit more than an inch thick) and the white plastic body won’t attract finger smudges. Below is a manufacturer photo labeling the Sensi’s on-unit buttons and screen elements. You’ll need to make an account with Sensi (through the app) when you set up your new Sensi thermostat and register your device. Be sure to write down the access code found on the back of your Sensi before you mount it to the wall, because you’ll need it during setup (if you forget, though, no big deal – it’s also included on a sheet of paper in the box). On my first setup attempt I accidentally neglected to finish registering the Sensi thermostat – and that prevented it from fully integrating itself with my app. So that’s my one bit of advice for setup: be sure to complete the registration step, or else you’ll be wondering why your thermostat doesn’t show in the app. 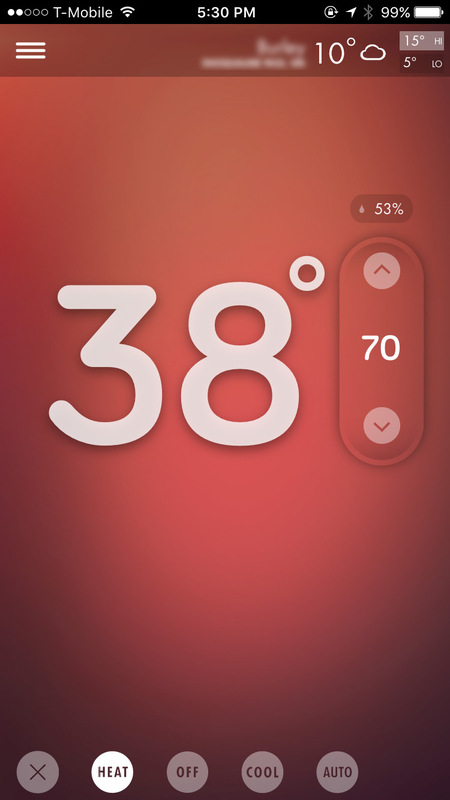 The upper right corner of the app’s default screen shows today’s high and low temperature, as well as current temperature and location. 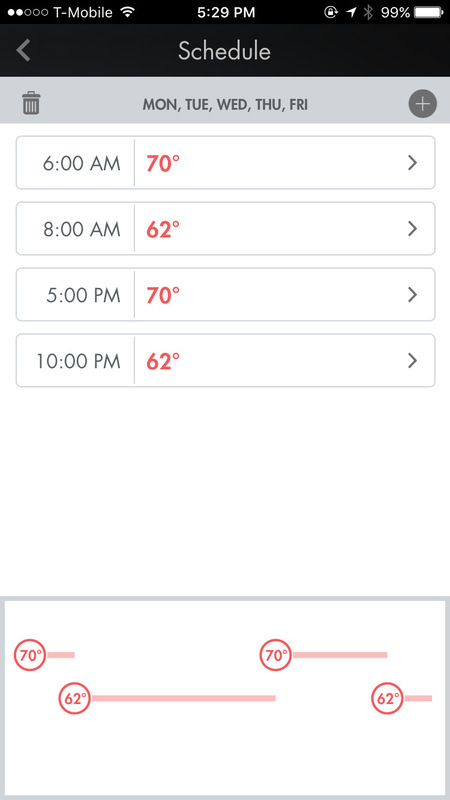 From here, you can set up schedules and adjust the current target temperature via the “hotdog” (or “hamburger”) menu in the upper left corner. 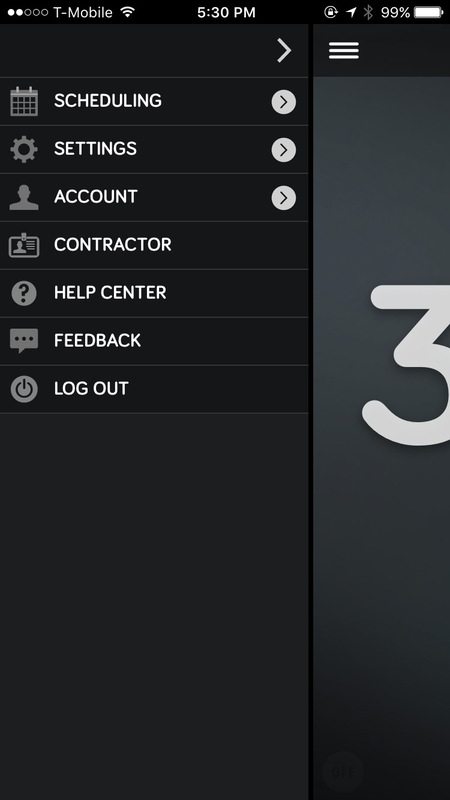 A tray pops out to show schedule options, settings, account info, access to help, and more. Everything in the app is straightforward and easy to figure out. There aren’t a lot of options, just a weekly schedule (you can build a fairly sophisticated schedule to accommodate shift work or children’s schedules) and some settings. Nearly all modern wireless routers meet these standards. Incompatible systems include line voltage and proprietary systems, gravity furnaces, in-floor, or millivolt wall systems. However, some systems can be made compatible by adding a 24 volt transformer. For assistance, Emerson recommends contacting Sensi Support. The Sensi is a smart choice if you want the convenience of a WiFi enabled thermostat from a renowned company and won’t miss features like geofencing or usage reports. Note that Amazon features two versions of this thermostat, the “DIY-Install” version and the “Pro-Install” version. They are the exact same thermostat, but the “Pro-Install” version comes with a longer warranty and costs less. Win win! Previous: Previous post: How much money can you save with a smart thermostat? I believe the Pro version is cheaper because you have to have it installed by a HVAC certified company in order to benefit from the 5 years warranty. The DIY version has the consumer grade regular 3 years. You can still buy the Pro version but if you need to use the warranty within the 5 years, you will have to call a company to have it switched and honor the warranty which can cost you more at the end. 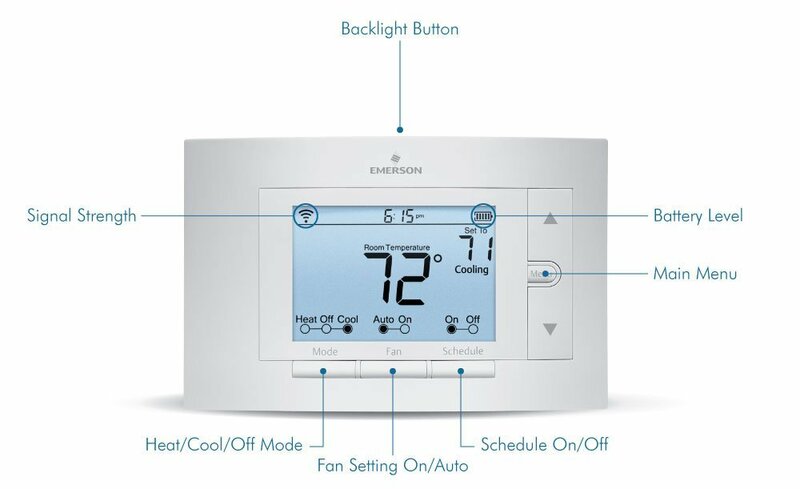 I intend to purchase the Emerson Sensi to help manage peak demand using a veryspecific schedule and like that there are up to 10 daily schedules so I can coordinate it with a second AC unit thermostat. Can it be scheduled to set a temp at any time (not just 15 minute intervals) meaning… at 3:40pm and set to 72 and then at 4:25 set to 80? Thank you. I just installed mine and no you cannot set it to specific times, only 15 min increments. looking to use this for my heat pump / forced air propane dual fuel system. It was upgraded automatically and now has a lock feature (kids, businesses). Also, I think it always worked with Wink home automation or it too was added. Great product. I’ve had mine for almost a year. There is one huge missing feature, however, and it’s not usage reports. Many users that I know (I’ve had 4 friends install one) have complained about the inability to set their own custom swing. If the swing is 1 degree and the set temp is 70, the system will heat at 69 and turn off at 71. If the swing is 2 degrees and the set temp is 70, the system will heat at 68 and turn off at 72. This feature would allow more user control for better comfort and would also prevent short cycling, which can quickly damage equipment. Please give us this important feature! Thanks Team Sensi! I live in rural Wisconsin and don’t have cell coverage yet. I can set up the units at our vacation home on someone else’s smartphone not my clamshell burner, or a laptop. After that I can access the app with any browser based device and erase the app on the borrowed smartphone. Seems like a small improvement that would be easy to implement would be browser based setup. We have two new furnaces with two central a/cs that two thermostats should manage well remotely. Can’t wait for them to arrive. A quick note – this unit supports only US and Canadian time zones. I’ve got mine installed on the east coast of Australia, and it’s a bit painful using Hawaiian time (20 hours behind) to schedule! Emerson support have committed to consider other time zones, but I’m not holding my breath. Also, the Honeywell units permit 0.5 degree Celsius control, the Emerson only 1 degree. It’s minor, but a degree Fahrenheit is about twice as precise as a degree Celsius and you lose that precision using the unit with metric units. Yes, I have the same problem. I just installed one in Melbourne, Australia and works fine and the only problem is it does not support our time zone…Hope the new firmware comes soon! We are away from home for thee months during the winter. How low can the heat mode be programed for an extended time period. That depends on the type of heating system. For gas fired forced hot air system by Lennox they recommend not going below 55degrees or else condensation will corrode the heating chamber. The thermostat can be set below that. I haven’t tried below 50 degrees. Is this unit compatible with a WINDOWS SMARTPHONE? I dislike APPLE products as they they are WAY overpriced, and Android is too “ICONY” for my tastes and a bit confusing for an “OLD DOS” nerd like me. The box says it does not require a “C” wire on “most” systems. My 2009 Furnace is not most systems I guess. Saying your product is “Universal” when it is does not work even just on the systems on Earth is deceptive advertising intended to trick consumers into buying a product that costs thousands of dollars to install. I am returning mine to Home Depot. I originally gave these thermostats a 5 rating, but each time you change cell phone or router you face a new ordeal. I replaced my router and cell and got support to remove them from registration and since then ZERO connectivity. They have become expensive “normal” thermostats that i could have got for $8 at home depot. THINK TWICE! Cannot be set below 50F. To access from web browser you need to subscribe to sensi manager service for $10/year/thermostat. sensi manager service would not accept my CC information. I will be buying something else, this thermostat is far too limited to be of any value. Not worth the aggravation. First, the one I purchased was defective. Had to run back to Home Depot at 9pm after spending a few hours working in the heat (no thermostat=no cooling) and with tech support to make it work only to find out the unit was defective. Then the second took a while to get set up – HVAC wiring from previous thermostat was not compatible with this device – although the app said it would work fine! Then, after getting it all set up and running I start having issues with wifi. Inconsistent – sometimes online sometimes offline. Turns out now Sensi support is saying that wifi won’t work consistently without a C Wire. DO NOT BUY THIS PRODUCT IF YOU HAVE A HEAT ONLY, COOL ONLY OR HEAT PUMP WITHOUT A C WIRE! If you look at the compatibility chart, https://sensi.emerson.com/en-us/support/how-can-i-be-sure-a-sensi-thermostat-will-work-with-my-hvac you will see a long list of incompatibility without a C wire. However, support will not tell you that until you’ve spent countless hours reconfiguring and even though they knew I had a heat pump. Their options now are run a c wire or buy a kit that replaces it. BTW – Search for No C Wire on their support site and you get no results. Support site is awful! No I have to go back to Home Depot and return the thing. No box or packaging as I threw that all away once the unit was working to provide adequate cooling. I’ve spent more time on trying to make this thing work that it’s worth. Should have stayed with a traditional programmable…And not Emerson!